Liatris plants produce tall spikes of purple flowers in late summer. What is liatris? Liatris (Liatris spp. ), also known as blazing star, gayfeather, or colic root (due to their historic medicinal use as intestinal antispasmodics), are perennials native to America’s prairies. Liatris plants can arise from corms, rhizomes or elongated root/crowns that sprout clumps of green, grass-like leaves that stay attractive all summer and turn a rich bronze in the fall. In late summer, liatris plants produce showy one to five-foot tall, upright bottlebrush-like spikes of bright purple (or sometimes white) flowers. The genus Liatris is in the aster family (Asteraceae) and contains roughly 30 species that occur in almost every U.S. state east of the Rocky Mountains as well as in southern Canada and Northern Mexico. At least 13 species and several hybrids are grown as garden plants. Four common species in cultivation in Wisconsin are L. aspera, L. pycnostachya, L. ligulistylis, and L. spicata. L. aspera (rough blazing star) prefers dry to moderately moist sites, naturally inhabiting sandy fields, dunes, abandoned roadbeds, and railroad embankments. This species is hardy to zone 4 and produces pink flowers in 1¼ to 3½-foot tall spikes in August through October. L. pycnostachya (prairie blazing star, Kansas gayfeather, or button snakeroot) prefers moderately moist to wet sites, naturally inhabiting damp meadows and tall grass prairies. This species is hardy to zone 3 and produces purple, rose-purple, or white flowers on two to five-foot tall spikes in July through September. L. ligulistylis (meadow blazing star) prefers moderately moist to moist sites, naturally inhabiting prairies, meadows and stream banks. This species is hardy to zone 4 and produces pink to purple flowers on three to five-foot tall spikes in August and September. This species is particularly useful for attracting butterflies. L. spicata (dense blazing star) prefers even wetter locations, naturally occurring in damp meadows and marshy places. The species is hardy to zone 3 and produces pink flowers on 1½ to five-foot tall spikes in August and September. There are several common varieties of L. spicata. •‘Alba’ has pure white flowers on spikes that are approximately 1½ feet tall. •‘Callilepsis’ produces long stems, thus making it a good choice for cut flowers. •‘Floristan Violett’ is a strong-stemmed cultivar favored by professional florists for its thick, violet-hued flower spikes. •‘Kobold’ is a small, compact variety with deep purple flowers that can be planted at the front of perennial borders. Where do I get liatris? Liatris plants are most easily grown from corms, rhizomes or elongated roots/crowns (depending on the species) that can be purchased at most nurseries or garden centers that sell perennials. These plants often bloom the same year that they are planted. Liatris also can be grown easily from seed. Start liatris seeds indoors or sow them directly in the garden in early spring. Seeds typically germinate in 20 to 45 days. Germination can be improved if seeds are exposed to four to six weeks of cold, moist conditions. This can be accomplished by planting seeds outdoors in the fall or early winter. Plants grown from seeds generally will not bloom until their second year. As plants age and get larger, dig and divide large clumps in the spring just as leaves are emerging. Separate corms or cut tuberous roots with a sharp knife or shovel, keeping at least one eye on each division. How do I grow liatris? Liatris grows best when planted in full sun and well-drained soils, and when plants are spaced 12 to 15 inches apart. 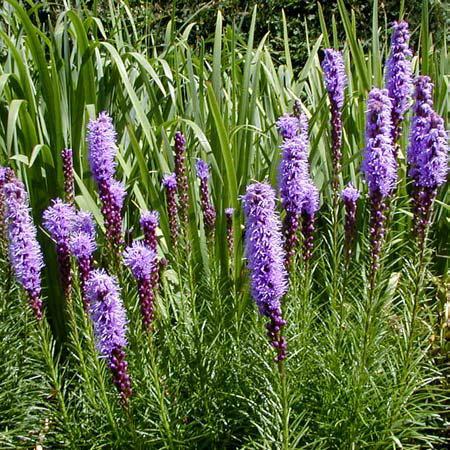 However, liatris will tolerate some shade, and poorer soils. 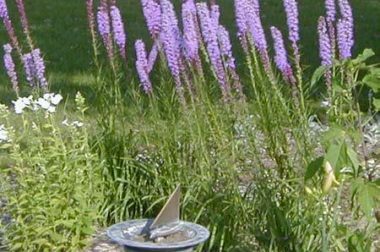 Liatris should be planted as early as possible in the spring after the last possibility of frost, but can also be planted in late summer or early fall when cooler temperatures return. Water plants regularly during the first growing season to establish a strong root system. 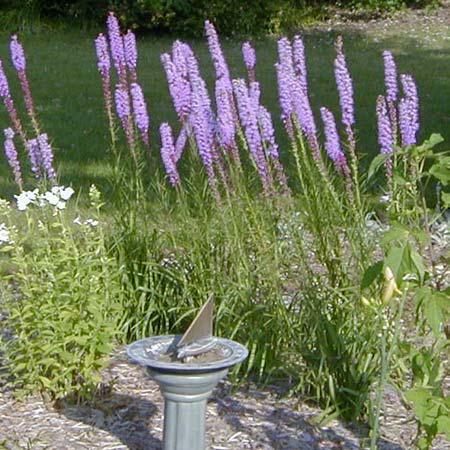 Once established, liatris plants are fairly drought tolerant. DO NOT overwater; plants can rot if the soil is too moist. Fertilize before new growth begins in the spring using a commercial fertilizer that you can purchase at a local garden center. DO NOT overfertilize (check the label of the fertilizer that you select to determine an appropriate amount); in some varieties, flower spikes will flop over if plants are grown in overly fertile soils. Liatris does not have any significant insect problems (other than flea beetles in some locations), but is subject to several diseases, including leaf spots (caused by Phyllosticta liatridis and Septoria liatridis), rusts (caused by Coleosporium laciniariae and Puccinia liatridis), powdery mildew (caused by Erysiphe cichoracearum – see University of Wisconsin Garden Facts XHT1005), white mold (caused by Sclerotinia sclerotiorum – see University of Wisconsin Garden Facts XHT1115), and Verticillium wilt (Verticillium albo-atrum). Spacing plants to allow for sufficient sunlight and air circulation will help minimize disease problems. How do I use liatris most effectively in my garden? 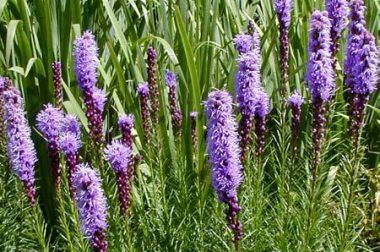 Liatris is a valuable addition to perennial gardens as a vertical contrast to mounded or broad-leaved plants, and is also at home in the meadow, a native plant garden or naturalized areas. The purple flowers of liatris contrast nicely with yellow-flowered plants such as cosmos (Cosmos spp. ), ‘Moonbeam’ coreopsis (Coreopsis ‘Moonbeam’), goldenrod (Solidago spp. ), or shrubby Jerusalem sage (Phlomis fruticosa), and blend well with pink flowering plants such as mallow (Malva spp. ), poppy mallow (Callirhoe spp. ), and purple coneflower (Echinacea spp.). Liatris also combines well with prairie grasses and silver-foliaged plants such as wormwood (Artemesia spp.) and lamb’s ears (Stachys byzantina). It looks particularly attractive when planted in large sweeps or drifts in informal settings. In a formal garden, liatris works well individually. The flowers are very attractive to butterflies, bees, and other insects. Liatris also make a great cut flower, both fresh and dried. To dry the flowers, harvest the spikes when one-half to two-thirds of the flowers are open. Spikes can be air-dried by hanging them upside down in a protected spot for approximately three weeks, or by using a desiccant such as silica-gel or sand (which often leads to superior color preservation). Liatris can be used in borders or in informal meadow plantings.